DearMYRTLE's Genealogy Blog: Is there such a thing as ethical plagiarism? The antenna went up when I read the following comment to Barry Ewell's Lessons Learned #50: Church Records Research Insight where Mark Andrew Davis comments 12 hours ago publicly: "Wow, this list look like it's verbatim from Terry Willard's study guide from the old PBS Ancestors TV Show (yes, I bought the book). In fact, just checking the pages and the information is identical. Hopefully you're not using the information without the Willard's, PBS and the Publisher's permission, but I don't see any indication on your posting what the source is and what permissions you have." Barry Ewell Facebook Fan Page, 27 June 2013. (https://www.facebook.com/photo.php?fbid=466799326700942&set=a.418756651505210.85472.406378449409697&type=1 : accessed 6 July 2013). 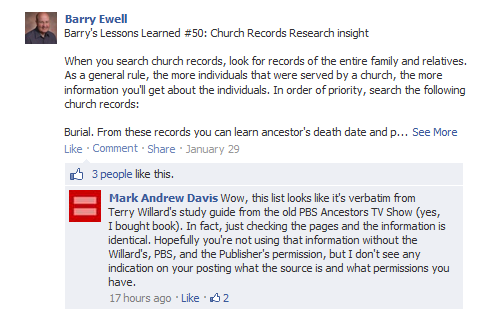 Genealogists worth their salt always question the reliability of a statement by checking sources. EXAMPLE 2: How would you rate the following text posted 6 July 2013 by Barry Ewell on his Facebook fan page created 29 January? Barry Ewell Facebook Fan Page, 6 July 2013. (https://www.facebook.com/photo.php?fbid=466802990033909&set=a.418756651505210.85472.406378449409697&type=1 : accessed 6 July 2013). 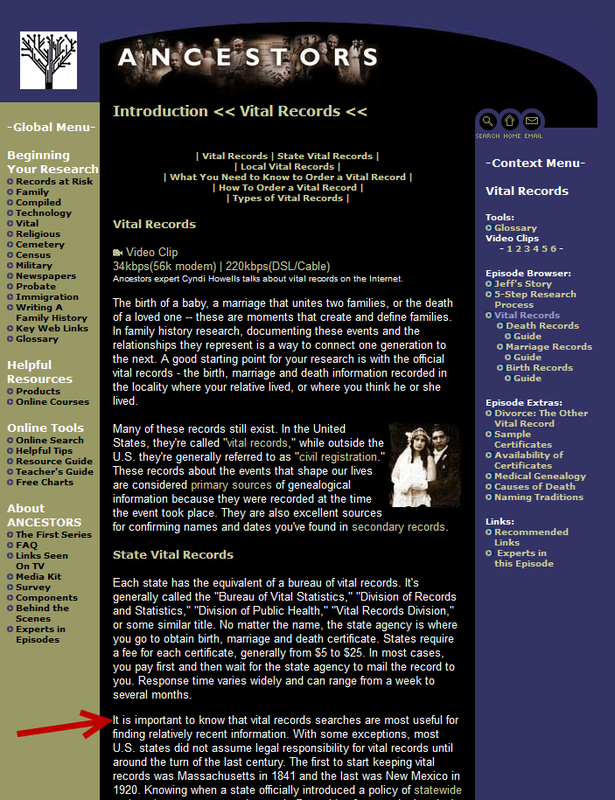 (http://www.byub.org/ancestors/records/vital/intro.html : accessed 6 July 2013). It is important to know that vital record searches are most useful for finding relatively recent information. Most US states did not assume legal responsibility for vital records until around 1900. The first state to start keeping vital records was Massachusetts in 1841, and the last was New Mexico in 1920. It is important to know that vital records searches are most useful for finding relatively recent information. With some exceptions, most U.S. states did not assume legal responsibility for vital records until around the turn of the last century. The first to start keeping vital records was Massachusetts in 1841 and the last was New Mexico in 1920. 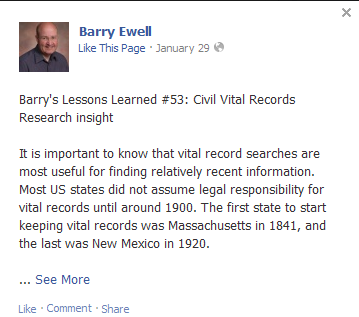 “ Barry’s Lessons Learned #53: Civil Vital Records Research Insight.” Barry Ewell Facebook Fan Page, 6 July 2013. (https://www.facebook.com/photo.php?fbid=466802990033909&set=a.418756651505210.85472.406378449409697&type=1 : accessed 6 July 2013). Cyndi Howells, interview. Brigham Young University Broadcast Services, Ancestors, circa January 1997, segment transcript and video clip by BYU Broadcast Services (http://www.byub.org/ancestors/records/vital/intro.html : accessed 6 July 2013). As Ol' Myrt here considers these comparisons, I’ve turned to Elizabeth Shown Mills, “QuickLesson 15: Plagiarism―Five "Copywrongs" of Historical Writing,” Evidence Explained: Historical Analysis, Citation & Source Usage (https://www.evidenceexplained.com/content/quicklesson-15-plagiarism%E2%80%94five-copywrongs-historical-writing: accessed 6 July 2013). DearMYRTLE has not communicated with any of the parties involved, but I find such recognizable unsourced quotes unsettling. We each must draw our own conclusions. Unbelievable! After everything he is still at it! And the plagiarism saga continues. Actually, adds more "proof" of his intent and mode of operation. The "good" that can come out of this is that the issue of out and out swiping someone else's original work will be discussed and, hopefully, more and more people will learn what is accepted and what it downright ILLEGAL. Happens all the time on FindaGrave, and I think it is wrong. People copy entries from books or from the cemetery's on-line look-up and claim it as their own. There defense is what is on a tombstone is "fact" and "facts" cane be copyrighted, a weak excuse. They did not gather the information, but feel comfortable stealing the info and claiming the work as their own. It's wrong. VERY wrong. FeelingHopeless, there IS a difference in copying dates off a tombstone and copying paragraphs off a website. The former is merely copying facts - which cannot be copyrighted (but must be sourced). The latter is clearly plagiarism if there is no attribution to the original author. If what you're suggesting is the copying of obituaries or personal memories that people have posted (or anything other than dates and places) on Find-a-Grave, then I agree - that is stealing if there is no attribution. I, for one, cannot believe that this sort of thing is still going on with this person. You would think a lesson would have been learned. So - in addition to my donation I made to Cyndi's list I'm going to delete any reference to his website or anything else of his from my website (right after I check to see if he's stolen any of my stuff). I work for a lawyer - I thrive on lawsuits. Geez! What a tool. What is wrong with him? FeelingHopeless - Although there are ethical considerations when copying cemetery transcription books into Find A Grave, the defense that facts cannot be copyrighted is fully supported by the law. The University of Michigan has a nice summary at http://www.lib.umich.edu/copyright/facts-and-data. "Simply working really hard to gather the data – what the Supreme Court called the “sweat of the brow” doctrine – is not enough." "It is important to remember that even if a database or compilation is arranged with sufficient originality to qualify for copyright protection, the facts and data within that database are still in the public domain. Anyone can take those facts and reuse or republish them, as long as that person arranges them in a new way." Take a look at his "historical settings" for England: http://mygenshare.com/category/2357/topic/2350/m/2351/item/2360?article=true. Many of them are lifted directly from the 1911 and 1922 editions of Encyclopaedia Britannica. He is charging people to see this material - as if he created the content - when it is actually in the public domain, and he is failing to give proper credit to the original authors / creators of the material. I'm not taking sides here, just want everyone to be clear about public domain material. "public domain -- n. 1) in copyright law, the right of anyone to use literature, music or other previously copyrighted materials after the copyright period has expired. Although the copyright laws have been changed several times, a rule of thumb would be that the last possible date for copyright protection would be 50 years after the death of the author. Thus, the works of William Shakespeare, Mark Twain, Jack London and other classic writers are in the public domain and may be published by anyone without payment of a royalty. 2) all lands and waters owned by federal, state and local governments." See http://michaelhait.wordpress.com/2013/07/07/copyright/ -- especially the slideshow. Just making another donation to Cyndi's List. * sigh * The "Ancestors" screen capture is from the 2000 season, and KBYU asked me to write just about all of the website content (I was the lead researcher for that season so was the natural go-to), so I suppose that makes me, KBYU and PBS his latest victims. I wonder if it might not be possible to orchestrate a boycott of some sort - though based on the comments I see about his Facebook page suddenly disappearing, perhaps that's already happening organically. I just can't understand why anyone would so deliberately antagonize what is supposedly their own community. I also wondered about all the photos that were used in his webinars, slide lessons, and on his Facebook pages. There are/were never any sources noted as to where those came from, and we know they were not all his. I asked him once about a particular photo - if it was his ancestor. He said it wasn't, but didn't mention where the photo came from. I see his Facebook group/page has disappeared now. The photos in his blog are licensed stock photos. I don't believe he ever represented them as being his photos--nor does he have to. These come from the same places as the generic stock photos that advertising agencies, newspapers, and professional bloggers use. Let's not confuse legitimate use of licensed material with unauthorized and illegal use of another's intellectual property.